Founded in 1951, Iron Mountain (IRM) is one of the oldest REITs in America, though it didn’t officially convert to a REIT structure until 2014. While the company initially started off as a paper document storage facility for New York City-based corporations, Iron Mountain has since expanded to become one of the largest data storage centers in the world. The REIT operates more than 85 million square feet of storage space in nearly 1,500 facilities located around the world. In total Iron Mountain serves more than 230,000 global customers, including 95% of the Fortune 1000. This creates a diversified and recurring stream of cash flow, with no single customer representing more than 1% of revenue. The company's top 20 clients generate just 6% of revenue. Currently the REIT's sales are dominated by storage in its core developed markets, especially North America. However, in recent years Iron Mountain has been diversifying into growth markets that it expects to help accelerate long-term cash flow growth from about 3.5% a year to 5% by 2020. Specifically, the company's strategy means a greater focus on physical storage in emerging markets (such as China), a 200% increase in ancillary services (such as entertainment and fine art storage), and a 600% increase in data centers (to protect digital information and host customers’ IT infrastructures). Iron Mountain is a unique hybrid REIT combining high value document storage and industrial operations. This allows the company to enjoy strong operating margins, courtesy of far higher customer retention (50% of boxes stored 15 years ago remain in IRM's facilities today), low operating expenses (maintenance capex just 3% of revenue), and healthy pricing power (high rent per square foot). A key to Iron Mountain's moat is its industry-leading scale. For example, the REIT has the most advanced logistics network in most of its core developed markets. This means that it can far more efficiently collect and transport customer documents to its storage centers than smaller rivals can. And because the cost of storage is a relatively low part of a client's operating budget, Iron Mountain is able to frequently raise its rents to offset inflationary costs, courtesy of its short (one to three-year) lease terms. When combined with the company's reputation for safety and reliability (sensitive documents are being stored or shredded), Iron Mountains's clients face relatively high switching costs, which is why the REIT boasts a 98% retention rate. In other words, clients tend to store physical data and records with Iron Mountain for very long periods. For example, the company's average box age is 15 years, and 25% of its clients' boxes are have been in storage for 22 years or longer. Since boxes sitting in storage require very little upkeep (unlike apartments or malls), Iron Mountain is able to earn a solid return on capital above 10% in its core North American physical storage business. Going forward, the REIT plans to continue growing in this important market by continuing to consolidate the industry, which has about 720 million cubic feet of un-vended storage that needs to be served in North America alone. That's compared to Iron Mountain's 680 million cubic feet of North America storage capacity, meaning there seems to be a reasonably long growth runway in the company's most profitable market. However, Iron Mountain's management is known for its long-term focus and is also focused on expanding internationally, including in fast-growing emerging markets. Here the margins are actually higher due to lower construction or acquisition costs. This is why the REIT expects its expansion into dozens of fast-growing economies to allow it to generate about 11% revenue growth for the next three years. The biggest and potentially most important growth catalyst for the REIT is in data centers, for which the global market is expected to grow 13% per year. Iron Mountain made several major data center acquisitions in 2017 to continue building a foundation in this space. The first deal was for Fortrust, in which Iron Mountain paid $138 million for 210,000 square feet of Denver data center facilities. Then later that year Iron Mountain announced a $1.3 billion purchase of IO Data Centers LLC. This deal included four state-of-the-art data centers in Phoenix, Scottsdale, New Jersey, and Ohio, with average lease lengths of 3.1 years and 98% customer retention rates. The REIT also purchased two data centers serving Credit Suisse's Singapore and London offices, each with 10-year inflation-adjusted leases. All told, Iron Mountain now has a data center presence in eight of the top 10 markets in the U.S., and two of the top 10 international markets. Over time the company plans to continue expanding until it has a strong position in all ten of the top U.S. and global data center markets. In order to achieve that and make data centers approximately 7% of its 2020 revenue, the REIT plans to invest heavily in the coming years, nearly tripling its overall data center storage capacity. 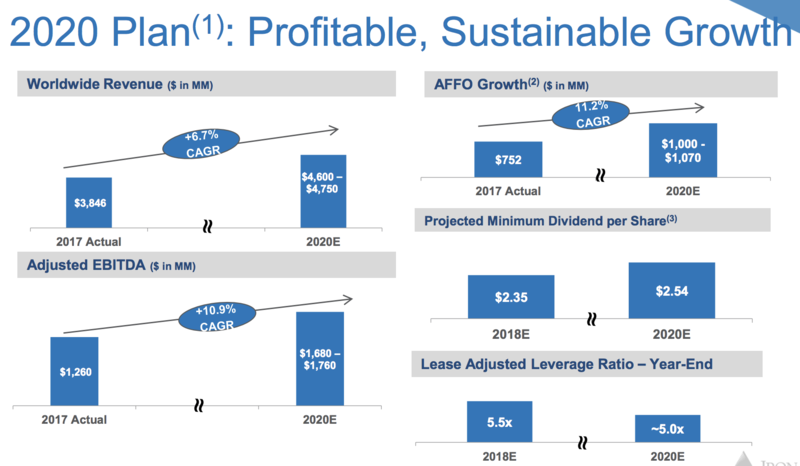 The combination of all three growth catalyst (North American storage consolidation, emerging markets, data center) is expected to drive strong growth in the coming years, including safe dividend growth (2020 AFFO payout ratio target 73%) of 4% a year through 2020. During this time, management also expects to steadily deleverage the company's balance sheet and hopefully earn Iron Mountain a credit rating upgrade that will lower its future borrowing costs. That in turn would mean lower overall costs of capital that would allow Iron Mountain to continue growing profitably and potentially generating 4% to 5% annual dividend growth over the long term. Overall, Iron Mountain's business certainly isn't the most exciting operation in the real estate sector. However, its predictable cash flow has resulted in a generous, reasonably secure, and moderately rising dividend. That being said, like all stocks, Iron Mountain has its fair share of challenges it will have to deal with in the coming years. Iron Mountain has become the dominant global player in its core market of physical data storage. However, in developed markets, such as North America and Europe, this is a very slow-growing business. For example, organic document volume growth, excluding acquisitions, is essentially flat in developed markets. Fortunately, Iron Mountain has been able to achieve strong growth via industry consolidation in these markets. Although acquisitions still provide somewhat of a growth runway, there is a limit to how much expansion can ultimately be achieved from this profitable core business, especially as more companies move to paperless (i.e. digital) documents. In other words, Iron Mountain will likely have to depend on faster-growing emerging markets (physical volume growth 3% to 6% a year) and data centers for most of its future growth prospects. However, the risk here is that Iron Mountain's management team doesn't necessarily have the expertise to build the same kind of enduring competitive advantages in these key growth areas. One of Iron Mountain's biggest challenges may lie in data centers, where it is a very new and relatively small player, one that's competing against industry giants with far more scale and expertise such as Digital Realty Trust (DLR) and Equinix (EQIX). Which brings us to the next potential risk, the very different economics of data centers. Specifically, they typically cost far more to purchase, meaning lower cash yields on acquired properties. For instance, Iron Mountain anticipates that it will be able to generate about 10% returns on capital from data centers compared to 12% to 14% for its physical storage business. Then there's the company's sub-investment grade credit rating, which means that Iron Mountain's cost of capital may be too high compared to peers to allow it to quickly and profitably expand via acquisitions (its preferred growth method) in this new market space. Take, for example, the four data centers Iron Mountain purchased in 2017 for $1.3 billion. The deal is only expected to be modestly accretive to AFFO per share in 2019, because the REIT had to sell 7% more shares at a relatively low price to pay for the deal. This could mean that Iron Mountain may have to lean more on organic investments (building data centers from scratch), which could put it at a disadvantage to its larger, data center pure-play competitors. Many of these REITs enjoy lower costs of capital due to their premium share prices and lower borrowing costs. Basically, the risk is that Iron Mountain will fail to achieve the scale and competitive advantages in data centers that it has in physical storage, dampening its long-term growth outlook (especially if the rise of digital documents starts weighing more on document storage demand its in most profitable developed markets). The potential for rising long-term interest rates is another risk factor to consider. Higher rates potentially make it harder for Iron Mountain to grow, at least in the short to medium-term. Rising borrowing costs (currently average of 4.7%) are part of it, but Iron Mountain also traditionally relies on a steady stream of low-cost equity capital to help fund its growth. For example, Iron Mountain sold 20 million shares in 2017 to help fund its growth investments, and management expects to do the same in 2018. However, with the share price being hit by rising interest rates, the REIT's cost of equity (and thus overall cost of capital) is rising and could hurt AFFO per share growth, at least in the short term. Iron Mountain represents a unique investment prospect, a hybrid industrial/storage/data center REIT whose competitive advantages in its core business results in the stable cash flows needed to support a generous and moderately growing dividend. While there are certainly risks to management's long-term growth and diversification plans, Iron Mountain has a solid 67-year track record of adapting to changing industry conditions. The company's experienced and disciplined management team has also shown a balanced but shareholder-friendly dedication to conservative payout increases that should serve income investors well in the coming years. Should Iron Mountain make progress deleveraging its balance sheet and see its continued investments in faster-growing emerging markets, adjacent business opportunities, and data centers bear fruit over the coming years, the company's profile should become all the more appealing for conservative income investors.